Week 3 has some stand out performances from all teams that were competing. Let’s start with Orangeville Prep’s PG 2020 Shemar Rathan-Mayes as he had one of his best performances this season with 16 points and 6 assists in the win against Hillcrest Prep followed by an 18 points and 3 rebound performance in a win against Arizona Compass Prep. Orangeville Prep’s SF 2020 Mathew Alexander-Moncrieffe had 29 big one in his squads win over RISE. MA got the rim at will, and showed off his stroke as well. TRC Academy’s Viktor Nausedas and Lorenzo Downey had another impressive week, scoring 20 a piece against the Tigers. For Cathedral HS, 2021 Josh Patterson continues to make a name for himself as a top three point shooting threat. He scored 22 in his teams victory over St. Benedicts which included 6 threes. Orangeville Prep remains number one for the 3rd week in a row. This week O prep played a trip down south that resulted in a 2-1 record. They also remain unbeaten in league play after a convincing 96-65 win over RISE Prep last night. RISE prep goes 1-1 this week with a disappointing home loss to Orangeville and a commanding victory against Lincoln. 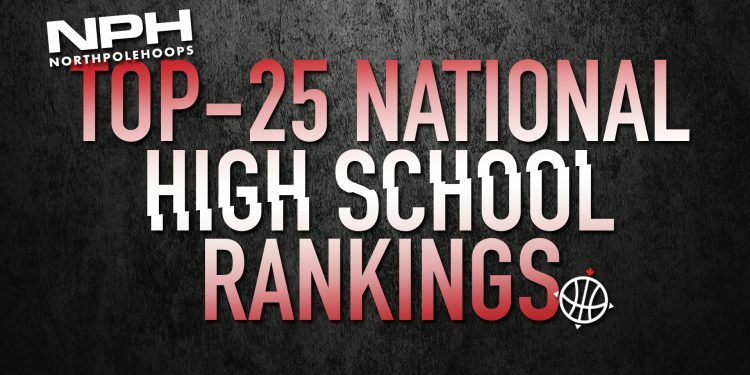 RISE Prep benefits from a thin schedule around the prep circuit to climb one spot to number 2 in the country. A quick turnaround for RISE is in the books as they will face AI Black tomorrow night in league play at Athlete Institute. Not being in action for this week has Top Flight slipping a spot to number 3 on our power rankings. They will be hosting the Ottawa NPA session scheduled next week. This will be where we will get the first real look at the defending two-time national champs in Canada. With a 4 point road loss to TRC Academy, Ridley took their first fall in the rankings this season. Down one stop from last week, Ridley now host the CAIS (Canadian Accredited Independent Schools) championships this week. Crestwood remains steady at the five spot after not playing this week. Their next matchups will be in the NPA Ottawa session at the end of the month. Edge remain at 6 after not playing this week. Much has been said about their players, system and players. Edge will matchup in the NPA Ottawa session at the end of the month. Halifax also had a quiet week with no games as they stay steady at 7. Besides their one game against Crestwood, Halifax Prep has been able to keep all of their league opponents to under 100 points. This speaks to the versatility of their defence at every position. Father Henry Carr will be looking to bring their league winning streak to four tomorrow when they will be taking on Bill Crothers. For now, they stay steady at the 8 spot after a week without games. A double date with top ranked Orangeville Prep tomorrow and Tuesday could be what the Thunder need to make a run as high as the top three in the power rankings by next week, should they get a pair of wins. They will need their full roster healthy and ready to go, something that has eluded this club so far this season. Look for Thow Biel and Cashius McNeilly to be at the top of their game. A home win over Ridley College has The Wolfpack back in the top ten. Another win against AI Black yesterday has the Wolfpack still sitting undefeated in league play so far this season. TRC is looking in very good form heading into week 4. TBA drop a spot with no games recorded this week. TBA will have to make a case for top 10 with a few more key wins. Right now their biggest win has come against #5 Crestwood. King’s Christian was able to right the ship with a convincing win over Bill Crothers. They then managed to knock off a scrappy Central Tech team to get themselves two games over .500 in league play. This is a team that is merely one or two quality wins away from claiming a spot in the top ten. A spot down from the previous week, the Pumas also played no games this week. Pine Ridge will be looking to head into top 10 territory as they are gearing up for their first American tournament in Buffalo. With a Championship under their belt from American soil, the Pumas will continue to add to their resume. Southwest Academy moves back into the rankings this week after having no games week 2. With a couple of league wins over AI Red and Bill Crothers they find themselves at 14. Southwest now sit second in their division. As other teams at this part of this list had won games this week, someone had to take a hit. LBA just happened to be a victim of thin scheduling, and for now will have to take a backseat until the NPA Ottawa Sessions have taken place. Vaughan will have a chance to climb the rankings tonight as they take on AI Red at home. Vaughan will to try to get closer to the .500 mark in league play. Another tough loss on the road to a top ranked team, combined with the re-entry of Southwest into the power rankings has Lincoln dropping two spots this week. They will get their next crack at moving up when they take on AI Red this Tuesday in league play. Another loss in league play has Central Tech falling a spot on the Power Rankings. Despite a respectful start to the year in their overall record, the Blues now find themselves on a four game skid in league play, and a possible trip further down the rankings should their slide continue. RNS travelled down south this past weekend to The Robinson School Invitational. With a victory over Prestige Prep, RNS has shown that they’re strength lies within their guard play and three headed monster of Shyheim Malcolm, Kellen Tynes and Sam Alamutu. A tournament gold at the Mike Sullivan Memorial in St. Catherines has Xavier holding on to their spot from last week at 20. Justus Salmon had another strong showing as the Tiger’s top scorer, but it will take a few more wins against some deeper rosters for Xavier to move any further in the power rankings. SBA has some of the best western Canadian prospects on their roster. As they play different competition from across the country watch as their comfort level begins to sink in. A week without games means a slip in the standings, as Oakville Prep prepares for the NPA Ottawa Session at the end of the month. A week without games means a slip in the standings, as GTA Prep prepares for the NPA Ottawa Session at the end of the month. With their only loss so far this year coming against Pine Ridge, Cathedral has earned their right to stay in the top 25 after going perfect over the weekend. Brebeuf College come in as one of the leaders in Quebec basketball. They have had two impressive victories so far this year winning both by just under 20 ppg. Lareldo Dixion, Christian Hewiitt Power #2 FHC Past Holy Trinity, St. Mike’s Rematch is Set!